This tureen is an adaptation of a French rococo design by leading goldsmith and designer Thomas Germain. It is the earliest known silver tureen made in Amsterdam and shows how French styles and dining fashions slowly spread across the continent. First introduced in France in the late seventeenth century, by the second half of the eighteenth-century tureens were in use throughout Europe. Tureens were invented when dining habits changed. In addition to their obvious function as food containers that could be placed on the dining table, they were an opportunity to display one’s style and wealth. Silver tureens were created as independent pieces, or as elements of lavish dining services for the elite. Throughout the eighteenth century silver tureens tended to be heavy and large, at times even monumental. In that respect they are comparable to other forms, such as ewer and basin that would have been designed for the silver buffet of earlier decades. Sir Arthur Gilbert (1913-2001) and his wife Rosalinde (1913-1995) formed one of the world's great decorative art collections, including silver, mosaics, enamelled portrait miniatures and gold boxes. Their collection is on long-term loan to the Victoria and Albert Museum. Oval two handled tureen of bulbous form with reed-and-tie border, on four scroll-and-foliage feet merging with vacant scroll-and-shell cartouches above, the scroll handles ending in sprays of oak leaves and acorns. The cover, chased with radiating shell motifs, and applied representations of dead game birds, vegetables and a scroll- and artichoke finial. The shaped oval stand with reed-and-tie border and a similar band applied within; a broad band of shell ornament is chased around the rim. Provenance: Baronne Alix de Rothschild; Christie's, London, 24 November 1976, lot 110; S. J. Phillips, London, 1982. The work of French Rococo designer and goldsmith Thomas Germain (1673-1748) who created lavish services with tureens for King Joseph of Portugal and Empress Elizabeth of Russia, inspired this Dutch tureen which bears Amsterdam marks for the year 1764. Its maker, Amsterdam silversmith Valentijn Caspar Bömcke, quotes the Rococo elements of a design which predates the tureen by sixteen years (published by Pierre Germain in Eléments d’orfèvrerie, 1748): the scrolling feet and cartouches, the figural decoration of the lid which alludes to the use of the container for stew. But Valentijn Caspar Bömcke did not simply copy French design, he adapted it for his time and environment, by adding bands of reef-and-tie as structuring horizontal elements while reducing the number of decorative applications and changing the overall proportions of the piece. This transition style is typical for Dutch silver of the time. It is a best of rococo that pays tribute to a style that gave way to neoclassical forms from the late 1750s onwards. Tureens as containers for food are a French invention of the late seventeenth century that reflected the need for impressive dinner plate. 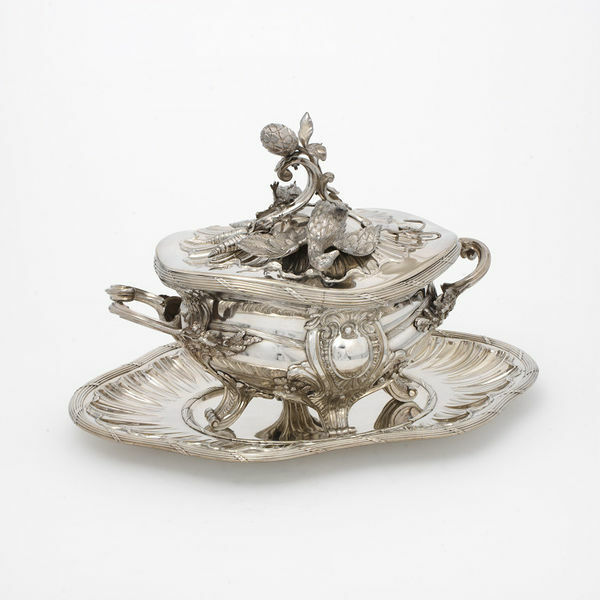 In Amsterdam silver tureens only appear during the second half of the eighteenth century. In fact this tureen is the earliest known example, with other Amsterdam tureens of a similar restrained rococo style marked for the following years (de Lorm, 1999, p. 171). Caspar Valentijn Bömcke was born in Dortmund, then a small Imperial City of the Holy Roman Empire. He became a citizen of Amsterdam and married Catharina Magtelt Halfman in 1757 which suggests that he also became master of the Amsterdam guild of silversmiths in that year. His name appears in a list of goldsmiths working in Amsterdam compiled by the guild in 1768. His son Cornelis Hendrik also worked as a goldsmith. Upon the death of his father in 1782, he took over his business commitments. Inventories made after his death show that both worked for the silver manufactory of the Brothers Peirolet – Gebroeders Peirolet, one of the major workshops in Amsterdam at the time. Soup tureen, cover and stand, silver, marked Amsterdam, Valentijn Caspar Bömcke, 1764.
de Lorm, Jan Rudolph. Amsterdams Goud en Zilver (=Catalogi van de verzameling van het Rijksmuseum te Amsterdam. Deel 3), Amsterdam: Waanders Uitgevers, 1999, pp. 171, 492, 525-526. This Dutch tureen was made in 1764, but the naturalistically modelled animals and vegetables had been a feature of French Rococo silver since the 1730s. This shows how French styles and fashions in dining continued to be popular throughout Europe.